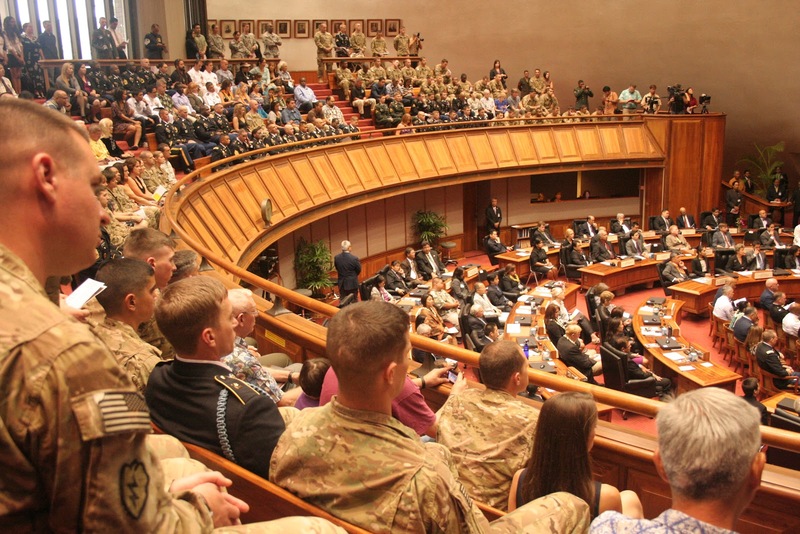 Hundreds of people gathered at the State Capitol Wednesday to remember 24 servicemen with Hawaii ties who died during the past year in Iraq and Afghanistan. Hawaii News Now. 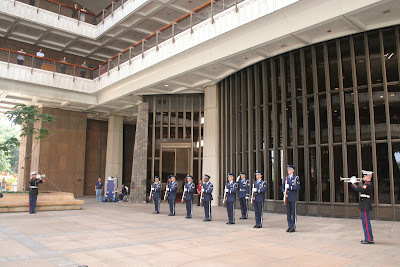 The annual Hawaii Medal of Honor ceremony is more than just a time to recognize and honor fallen troops. It's a time for friends, colleagues and loved ones of the dead to gather, console and connect with each other, to be reassured that those close to them will not be forgotten, and to be welcomed into the island ohana. Star-Advertiser. The families of two dozen fallen service members received the Hawaii Medal of Honor on Wednesday. It was a chance to thank them and their loved ones for protecting our country. KITV4. Abercrombie: Environmental Critics Are 'Apocalyptic Naysayers' Civil Beat. Large private sector employers without labor contracts would have to provide workers with up to five days a year in paid sick and safe leave under a bill approved Wednesday by the state Senate Judiciary and Labor Committee. Star-Advertiser. Should the State of Hawaii open up its own bank? Some lawmakers want to saying it will stimulate economic growth and development. But opponents say taxpayers shouldn't be backing risky loans. Hawaii News Now. Public assistance recipients might be able to put away more in savings under a proposal before the state legislature. Associated Press. A 90-plus-page bill to boost the accountability of Hawaii charter schools is racing toward passage in the Legislature. Civil Beat. A bill that would relax some of the state building code requirements was gutted when it crossed from the House to the Senate, Rep. Robert Herkes, D-Puna, Ka‘u, South Kona, North Kona, said. West Hawaii Today. Dog fighting bill ripped, gutted and turned into something else. KHON2. Hawaii Land Use Commission’s top exec Dan Davidson will retire. Pacific Business News. Navy Seeks Expanded Partnerships to Reach Clean Energy Goals. Hawaii Public Radio. Civil Beat Editor and General Manager John Temple has accepted a new position as managing editor of The Washington Post. Civil Beat. The arrest of four city supervisors and eight inmates on drug and contraband charges has triggered scrutiny of the prison work lines. KITV4. More new Honolulu residents moved from San Diego than from any other county in the United States, and more former Honolulu residents moved to San Diego than anywhere else. Civil Beat. The Honolulu Authority for Rapid Transportation's newly appointed CEO Daniel met with the head of the Federal Transit Administration and Hawaii's congressional delegation this week to lobby for federal funds for the city's planned $5.3 billion elevated steel on steel rail project. Hawaii Reporter. As the city and county of Honolulu prepare to begin construction of the $5.3 billion rail project, KITV4 News has learned some out-of-state workers are already on the job. KITV4. Honolulu Zoo staff Wednesday were trying to lure back three exotic birds after they escaped earlier this week when vandals cut holes in their cages. Star-Advertiser. The county could save up to $1.5 million annually by trucking East Hawaii’s garbage to West Hawaii rather than expanding the Hilo landfill, according to a consultant’s report released Wednesday. West Hawaii Today. Hawaii's largest grower of macadamia nuts plans to break into the business of making and selling processed food products after decades of selling raw nuts to processing and marketing companies, including Hershey Co. Star-Advertiser. The Hilo Veterans Administration clinic is looking for a new location in town to call home. Tribune-Herald. Spilled mercury found Wednesday at a Hawaii County Department of Water Supply facility in Waimea resulted in no reported injuries, according to the Hawaii Fire Department. West Hawaii Today. Mayor Alan Arakawa said that the county can cut around 33 positions from its payroll for 2013, thanks to his employee attrition policy. Maui News. The Liquor Commission’s recommendation to remove the 12 cap limit for hostess bar licenses on the island, “is too extreme a change all at one time,” said Maui Mayor Alan Arakawa. Maui Now. A settlement has been reached in a dispute over the proposed 310-room expansion of the Grand Wailea. Maui News. The entire island of Kauai went dark, some communities for six hours Wednesday, when a transformer failed at Kauai Island Utility Cooperative's Port Allen Generating Station. Star-Advertiser. The power outage that occurred at the peak of the Wednesday afternoon rush hour was an island-wide shutdown. Garden Island. The Kaua‘i County Council spent the entire day deliberating on a bill proposing further property tax exemption for Kaua‘i residents, only to see decision-making cut short by the island-wide power failure about 5:15 p.m. Garden Island. Molokai residents are used to some of the highest gas prices in the nation. But with an overnight jump of 25 cents last week – reaching $5.36 for regular unleaded – even locals were left in disbelief. Molokai Dispatch.